That would be the name of my Food Channel program if I was a host, “If I Can Do It You Can!” I’m the first to admit I’m not a candidate for Top Chef. The problem with cooking is I’m not great at it, its boring, and clean up is a pain in the bum. If an ingredient needs prepping (ex. carrots cleaned, skinned, and cut) you can guarantee that the last 1/4 of it is going to be handed to Riggins just to get rid of it. I’m the queen of the short cut. Why cook chicken when my corner Ralph’s makes a great roasted chicken already cooked and ready to go? If you can find something pre measured and boxed or already 1/2 completed I’m going to use it. Mom didn’t raise a fool. Unfortunately, I’m on a budget so as I tighten my belt I’ve made an attempt to be more open-minded about cooking (gasp) from scratch. * Can I read the list of ingredients without falling asleep (aka not a long list)? * Do I understand all of the cooking terms (I’ve looked up sear before so this really limits what I can make)? * Do I have all the ingredients and if I don’t do I know what they are and approximately where they are in the store (this has been a real problem with trying to find dog biscuit recipes)? * Is it healthy (this doesn’t apply to most desserts)? * Is it Wendy stomach compatible (my stomach hates a large list of foods)? Move over guacamole (I love guac so much that this is really hard for me to type) there is a new dip in town! There are a zillion different versions of Cowboy Caviar on Pinterest but I found the easiest! I strongly dislike the name of this dish so from now on it will be called Wendy’s Famous Dip. It is crazy good. On top of that leftovers work well as the guts of a veggie burrito! There won’t be leftovers so I suggest putting some of the deliciousness in another container and sticking it in the back of the fridge just for you. My Changes – No red onion. No cilantro. Added green onion (is that what you call the long skinny green stalk like things that have a tiny little white bulb at the end? — you know what I mean. I added that thing). I honestly don’t know why every parent on this planet doesn’t have bananas stocked in their freezer at all times. If you freeze bananas and then put them in the food processor (this woman’s insane. Blender won’t work. If you don’t have a food processor go to Target and get a cheap one) you get banana soft serve ice cream. Okay you and I know it isn’t ice cream but you know who doesn’t? EVERYONE WHO EATS IT. It really is magic. My changes – I don’t like bananas. The texture, taste, really everything makes me want to gag. So I cover that taste up with a scoop of peanut butter and some coco powder. In reality anything can be added to change-up the flavor a bit. Also this woman spent way too much time cutting these bananas up. You are going to put them in a food processor after all. Just chop them into chunky pieces and freeze. I put each in its own plastic bag so I know how much is one banana. I can’t digest red meat (this is as tragic as it sounds as steak is delicious) and don’t like fish so chicken is my go to protein. When I had a job I’d buy one of those pre cooked whole chickens and then peel off what I needed during the week to add to dishes. I had to find a way to do it cheaper but cooking chicken scares me. I’m afraid it’s going to be undercooked and kill me or I’ll cross contaminate and the next time a cut up an apple it will kill me. I found this recipe and thought I’d give it a shot. YOU GUYS IT TOTALLY WORKS. I was in awe as I was easily able to shred my cooked chicken breast. Honestly I had no faith in it at all. I now have a tupperware of shredded chicken in my fridge to grab when needed! My changes – I didn’t have chicken broth. Believe it or not this is actually odd. I normally have left over chicken broth in my fridge at all times (not kidding). Now that I needed it I didn’t have it. I substituted that for one cup of water and one cup of white wine. For “spices” I grabbed a bottle of mixed spices called California Garlic Mix (or something like that). I’m sure chicken broth would be better but this is pretty dang good! Did you know that you can make brownies from scratch and don’t have to use a box? I was shocked too. These are pretty tasty! I did try to cheat and mix by hand but after a while gave up and brought out the mixer. Probably a good idea. My changes – I don’t like egg yolks so any recipe that calls for eggs is going to have the equivalent of egg whites instead. I wasn’t happy with the amount of sugar so put in 1/2 a cup and then 1 cup of applesauce. My butter was salted because that’s what I had (it’s shocking I actually had butter and didn’t use margarine but I had some left over from Xmas treat making). Finally I sprinkled powdered sugar on top because I’m fancy like that. You had me at three ingredients. I’ve made these a couple of times and they are a good cookie to stick in a container and the fridge so you have a sweet (but not to sweet) treat to end your day with. My changes – Once again egg whites instead of eggs. I also added a cup-ish of oats (because oats are delicious) to my second batch so it’s now a four ingredient recipe. This woman is overselling these things a bit but I do like them. Warning they are DENSE so really are a breakfast dish. My love for oats overpowered my dislike of banana in these. My changes – Do I need to say the egg white thing again? I didn’t have chocolate chips just hanging around (who does) so grabbed a small handful of chocolate melts (because it makes MUCH more sense that I had those lying around) and chopped them up into pieces. Ha ha ha! I said balls! Ha ha ha (14-year-old). I can’t put into words how good these are! The best thing about making desserts is that I know what is in them and it disgusts me which means I am not tempted to eat them. I ate these. Yum yum yum! Seriously if you are going to make anything on this list make this (or the Wendy’s Famous Dip). My changes – I used caramels from Trader Joes instead of Kraft caramels. I was at Trader Joes and theirs are bigger which means less to unwrap so really a no brainer. Even with that extra help I don’t think I used as much as the recipe calls for because I was sick of unwrapping. These are easy to make. That’s really all I have to say about them. People did really like them but I wasn’t blown away. My changes – One batch I made with milk chocolate vs. white simply because it worked better for my presentation. One batch I used coconut oil and one olive oil. Both worked. I also spent a large amount of my time googling “cinnamon sugar” to try to figure out if it was different from just a mixture of sugar and cinnamon. It isn’t. I don’t know why they just wouldn’t say that. Cooking snobs. These are easy to make, pretty and don’t cause much of a mess. Sold! They also look impressive so they get an extra star for that. 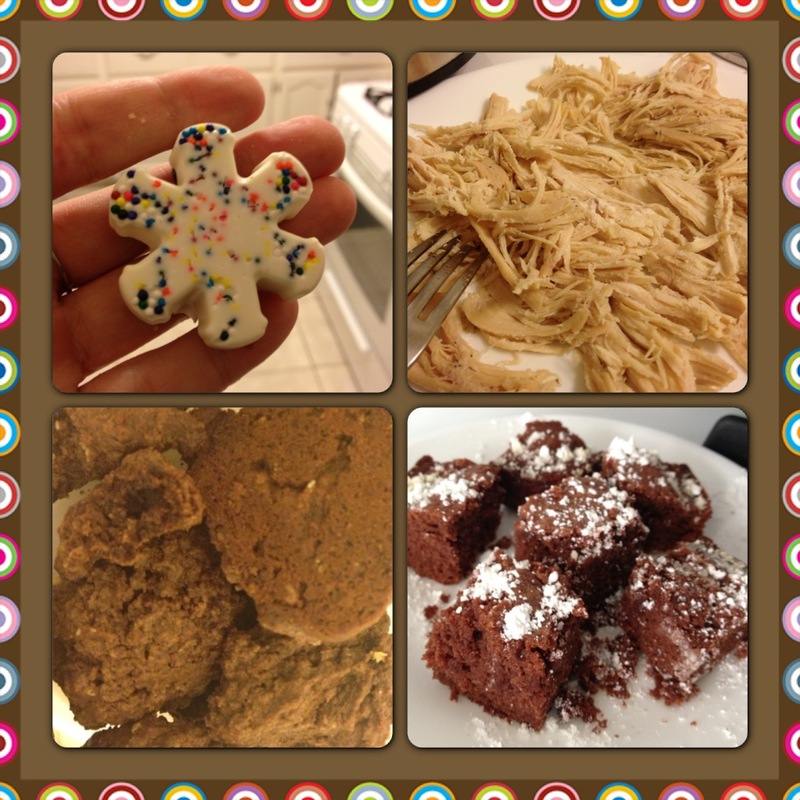 My changes – I didn’t use chocolate chips. Really how much sugar do you need people? I have no idea what Vanilla Candiquik is. I used white chocolate melts. I was using a snowflake mold but it was a treat for a New Year dinner so I added colorful sprinkles and called them white chocolate fireworks. No one was fooled. Finally I subed walnuts for peanuts because I had them. These are delicious. I really liked them more than I expected. I’ve made them twice once for a party and once for my family for breakfast during the holidays. Don’t make them for a party. That was actually kind of dumb of me. They taste better hot and don’t travel and sit on a party chip table well. It would also have made my life a lot easier if I had an apple corer. But I don’t. My changes – Ummmm … everything. I bought pancake mix, added water, and dipped the apple rounds in them and cooked them like normal pancakes. Then, because I’m lazy and didn’t want to make the sauce, I added powder sugar and called it a meal! This stuff is pretty tasty! I can see that it would be a winner as a family dinner dish. I’m incapable of cutting down a recipe to accommodate just little ol’ me so when I made this I ate it for dinner for over a week. It got old after night 4 but before that I was semi amazed that I had made something so yummy. My changes – I didn’t make the fried rice. I made a rice but it wasn’t this rice. That egg white thing. I changed canola oil to olive oil. Once again the amount of sugar scared me although now that I’m looking at it again it doesn’t seem like that much. I think I may have read it as 3-4 cups instead of 3/4 of a cup. Whatever. I used 1/2 the sugar (whatever I thought it was) and 1 cup of apple sauce. There you go! If you have a Pinterest pin that passes everything on my checklist please share! Happy cooking (and cutting and cleaning — sigh it’s already too much). There are LOTS of Wendyisms in that blog. So you. That’s great! I’m sure she can whip those up in no time. I’m sure she already knows her way around a kitchen better than me.